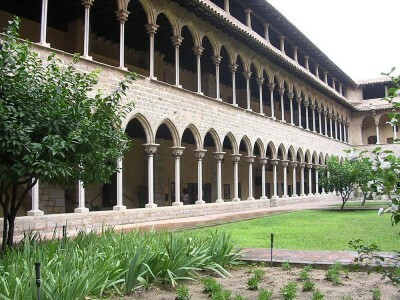 The Monastery of Pedralbes is located in Barcelona, Spain. In Spain the monastery is known as “Monestir de Pedralbes.” Many who visit the location say that it is like taking a walk back through time. It is a quiet place, full of peace and tranquility. Dating back to the early 14th century, the Monastery gets its name from the Latin “Petras Albas,” which means, “white stones.” With the support of her husband, King Jaume II, Queen Elisenda de Montcada received permission from Pope John XXII to build the structure. Taking one year to complete, the monastery opened in 1327 and served as a convent for the Poor Clares. In the early 14th century, this religious order was new to Catalonia, and the Queen felt it would infuse new life in Barcelona’s Catholic religion. With the death of her husband the same year it was founded, the Queen made a decision to retire there herself. She had a palace built for herself adjacent to the monastery. St. Michael’s chapel, on the right side of the monastery, houses frescoes from 1343 which depict Jesus and Mary. The monastery still houses nuns to this day. Some of the nun’s living quarters, the abbey, as well as the tomb of Queen Elisenda, can be seen on a visit. The Queen’s tomb has a double-sided sarcophagus. There is a museum that is rich in artwork as well as objects from the convent from the past centuries. The outdoor gardens are one of the quietest places in Barcelona. A Renaissance fountain is centered in the courtyard. The cool shade of the palm trees and the music of singing birds make the gardens another relaxing part of the Monastery of Pedralbes.